A fascinating insight into Britain’s built heritage and the diverse housing styles of the twentieth and twenty-first century. This book showcases 100 houses – one from each year from 1914 – that represent the range of architectural styles throughout the years and show how housing has adapted to suit urban life. Each house is accompanied by stunning photography and texts written by leading architectural critics and design historians, including Gavin Stamp, Elain Harwood, Barnabas Calder, Ellis Woodman and Gillian Darley. From specially commissioned architect-designed houses for individuals and for families to housing built for increased workforces, each of the 100 houses brings a different design style or historical story. There are houses built as part of garden cities, semi-detached suburban houses, housing estates, eco-houses, almshouses, converted factories and affordable post-war homes. 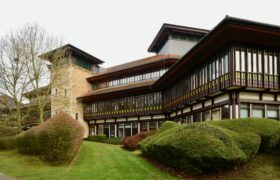 The architectural styles encompass mock Tudor, modernist, Arts & Crafts and brutalist and the featured architects include Giles Gilbert Scott, Walter Gropius, Edwin Lutyens, Powell and Moya and David Chipperfield. The book also contains essays that explore the social and political aspects of housing design in Britain over the last 100 years, including Elain Harwood on ‘What makes these houses special?’, Kathryn Ferry on ‘Labour-saving homes: The impact of domestic technology’ and Alan Powers on the architect and the client: ‘Now, building your house can be ever such fun’. Whether exploring Grayson Perry’s folly-like House for Essex, Patrick Gwynne’s modernist glass villa in Surrey, Sarah Wigglesworth’s Straw Bale House or Simon Conder’s black rubber-clad fisherman’s hut in Dungeness, this book gives a glimpse into the wonderful housing in Britain and is a must-have for all fans of design history and architecture.